The new Vantage is absolutely stunning, but what about that colour? The Vantage badge has been worn by some true icons over its seven decade history, and the outgoing model is the single most successful model Aston Martin has ever sold. The new Aston Martin Vantage has some big tyres to fill then, and luckily, Aston Martin isn't playing it safe. The Vantage has been designed to have a predatory stance. It's menacing, filled with intent. It's not style over substance, though: aerodynamic performance was central to the Vantage design. A series of splitters and channels funnel air where it needs to go, ensuring a significant level of downforce and cooling. To finish it off, new light signatures give the Vantage unmistakable road presence. The new sports car is bold, distinctive, and sure to be divisive. We love it. The design story continues inside the Vantage, with a dynamic and focused sports car cockpit. The Vantage sports a lower driving position for a more immersive driving experience. Aston Martin has used a combination of rotary and toggle style controls. The Vantage features a high level of standard equipment, including keyless start/stop, tyre pressure monitoring system, parking distance display, park assist and front and rear parking sensors. The In-Car Entertainment system, which is based on Mercedes Comand system, is controlled and viewed via a centrally mounted 8” LCD screen. The Vantage interior also offers generous stowage space, with useable room behind the seats and generous double-tier storage areas. So it's practical as well! Aston Martin also offers a wide range of personalisation options, including Sports Plus seats and Sports steering wheel, carbon fibre interior and exterior detailing, and a Premium Audio System. At the heart of the Vantage is a 4-litre twin-turbo V8 engine. It's set low down and far back in the chassis for a perfect 50:50 weight distribution. The V8 engine develops 510PS and 685Nm of torque. Aston Martin has tuned the induction, exhaust and engine management systems to give the Vantage a truly intoxicating character and soundtrack. It's capable of accelerating from 0 to 60mph in 3.5 seconds and on to a maximum speed of 195mph. 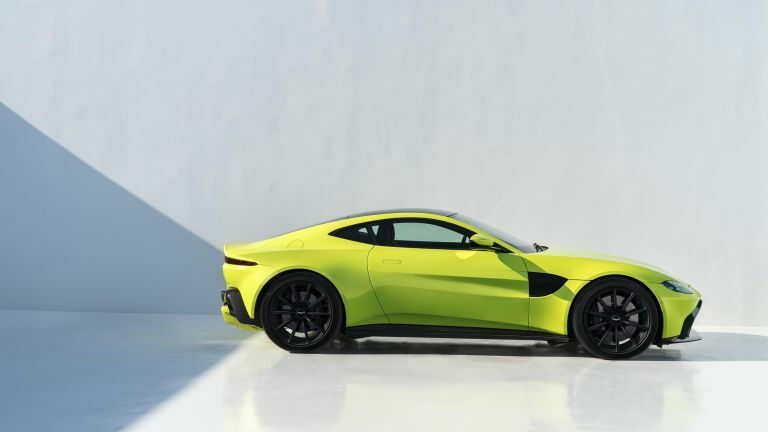 The chassis is an evolution of the latest generation bonded aluminium structure first seen on the DB11, and for the first time on an Aston Martin the new Vantage also features an Electronic Rear Differential (E-Diff). The new Vantage promises to be more agile, responsive, sharper, vocal and exciting. Are you ready to buy one yet? We certainly are. The new Vantage is on sale now with a recommended retail price from £120,900 in the UK, €154,000 in Germany and $149,995 in the USA. Deliveries are scheduled to begin during the second quarter of 2018.